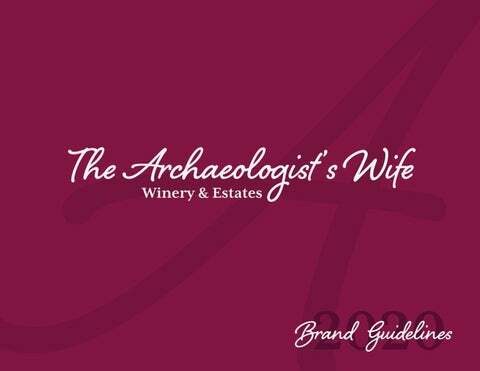 The Archaeologistâ&#x20AC;&#x2122;s Wife is proud to serve you traditional wines while sharing stories of adventure with you. We are here to encourage you to explore without needing a passport. Our goal is to introduce you to our traditional wine making techniques that are hundreds of years old. Our Story Story telling is what we love. We are a winery located in the Niagara-on-the-Lake region of Ontario, Canada. We have a beautiful property with breathtaking views of our 70-acre vineyard. Our winery was established in 2012 and we have been growing ever since. What makes us different than the rest? We offer stories with our wine. As young wanderlust individuals, we dream of traveling and learning about the world we live in. We are a team of two - myself and my husband- who are here to give you wine with a narrative. As you may have guessed by our name my husband is in fact an archaeologist. His passion is history and my passion is wine. Together we are here to provide you with an authentic storytelling & wine tasting experience. We aspire to inspire. Our goal is to make you feel at home in our home. We are excited to share stories with you and hope that you might have one for us too. We want to create a sense of wonder in everyone, and great wine too. So grab a glass, pull up a chair, and come share some stories. Calling all travel bugs. We want to meet you. Since we are a winery we will not serve anyone under the age of 19 (as that is the legal drinking age in Ontario) any alcoholic beverages. Although we do have a line of organic grape and pear juices that our under-aged friends and designated drivers will enjoy. We are a welcoming environment that encourages storytelling, sharing, and listening. We aim to attract dreamers, go-getters, the excitable, the bubbly, and the laid back who value a good time, great company and an adventurous story. We encourage everyone to join in on the fun. Come celebrate a wedding, a birthday, an anniversary, or even come visit just for the sake of writing your next adventure. Our primary typeface (Mrs Eaves XL Serif OT) has been chosen due to its sophistication, structured qualities, and readability. It is also formal without appearing too heavy. Mrs Eaves is available in regular and bold. Our second typeface (Shelby) has been chosen due to its elegance, and personal qualities. Our script typeface ties to our love for history as it is personal, soft, and free-spirited just like us. The script is available in regular and bold. Here are the instructions on how to create the text effect shown on the left. Shelby is to be used as the text in the background and Mrs Eves is to be used in the foreground. The colour of Shelby is our “White Wine” Colour (see page 20) and Mrs Eves in black. The background text is also to be set to an opacity of 69%. The baselines must NOT line up they need to be offset by 5.8 of an inch. Our main brand colours are our “White Wine” for our white wine collection and our “Red Wine” colour for our red wine collections. As our brand grows and has more collections of wine this colour palette will also expand. Our logo can be translated into these colors as well if needed for various applications. Colours will also depend on which geographical collection we are releasing. The images used throughout this book are an example of how we would like the public to see us and recognize our brand. Or photos can be landscape shots of our vineyards or detail shots of our winemaking process. Our Imagery must be clean and crisp. We pride ourselves on looking fresh, warm and inviting. Our best shots follow the rule of thirds, have a main focal point, and utilize depth of ďŹ eld. We also use imagery that hints at travel and movement as they are visual representations of the stories we tell. Imagery must be positive and inspiring. Our logo is clean and elegant. We put an emphasis on its timeless quality since we too want to go down in history. We ask that you use our logo for its intended purpose and treat it with respect as this is how the public will see us. Please do not hesitate to reach out if you have any questions. You can ďŹ nd our contact information at the front of this book. No part of the logo may be manipulated or changed. The scale must stay proportionate. The logo is to used in white when on the red wine labels and in black on the white wine labels. Use the most legible colour (white or black) when placing the logo over imagery (see examples to the right). 1. Do not add a drop shadow to the logo 2. Do not place the black logo on a dark background. In this situation, the white version of the logo should have been used. 3. Do not place the logo on any form of angle and do not move the “Winery & Estates” part of the logo. 4. Do not add any 3D effects, textured effects, or colours that are not included in this brand book. Time to see how it all works together! The example chosen is our wine labels for our ITALY collection. All labels should follow this layout although the text and content will change. These are the images that are used throughout this proposed brand book. If the client so wishes to use these images they will be required to purchase the license for these images.